Description: A good game of darts is a quintessential British sport, yet dartboards are rarely considered a desirable decoration item. Huntsman took on the challenge to create a luxury dartboard, by once again pushing the boundaries of Tweed. 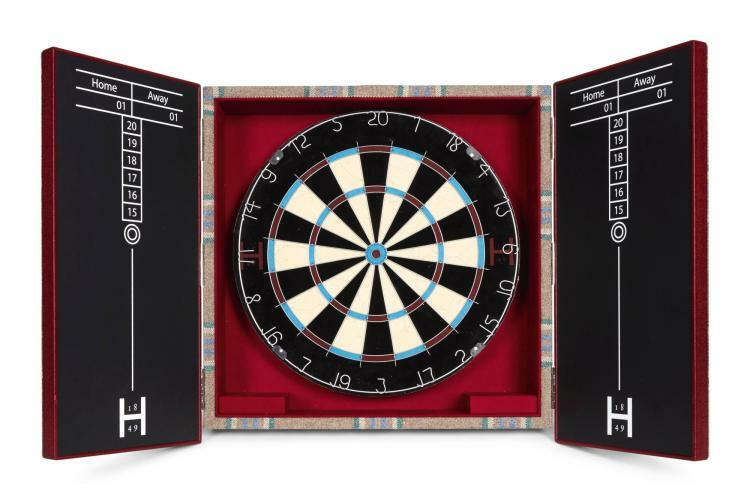 For this exclusive Huntsman House Tweed dartboard cabinet, the house worked with luxury board game artisans Geoffrey Parker to create a striking cabinet including a customised Winmau sisal dartboard in the Huntsman House colours. Original slate score boards and two sets of tungsten darts with bespoke flights complete the set.